Objectives: The sense of smell is important for all animals; odors are associated with identifying and locating food, determining food quality, and identifying threats. In humans, loss of sense of smell occurs with normal aging and is associated with a loss in quality of life. A decline in the ability to detect and discriminate odors also can be a harbinger of neurodegenerative conditions such as Parkinson's disease and Alzheimer's disease. Moreover, the olfactory system is an important model system for exploring neural computation including changes in neural circuits in response to the environment and experience. The olfactory system provides specific and important advantages for understanding learning and memory, one of the most important goals in neuroscience. 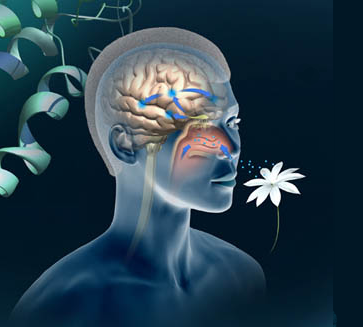 Recent technological advances have led to a wealth of information about how olfactory coding takes place in the mammalian nervous system, where experimental approaches range from large-scale measurement of neural activity during behavior to manipulation of activity via optogenetics. Integration of these data through comprehensive models of the neural networks involved in olfactory processing will provide a significant advance in our understanding of olfaction, including the relationship between neural activity and behavior. Our workshop goal was to review the current state of the mathematical approaches and tools for modeling olfaction. We also identified tasks for future development that will maximize the impact of individual projects, and defined areas of mutual interest and establish collaborations for large-scale modeling of this system, with a focus on incorporating realistic biophysical mechanisms for learning and memory. Playlist of online videos. Selected presentations were streamed live during the Workshop and were archived for online viewing. Summary Report. Participants presented short overviews of their own work and thoughts regarding: (1) experimentally observed properties that are important for large-scale modeling of the olfactory bulb, (2) the current state of modeling of this area and what is missing from these models, and (3) neuroinformatics resources that could be helpful moving forward, including databases and software tools. Group discussion over the course of the workshop gradually led to convergence to several important topics that are necessary for creating and understanding large-scale models of the olfactory system, including the characterization of odor space, learning and memory, and the role of feedback from piriform cortex on olfactory bulb dynamics. We also discussed ideas about a roadmap for moving forward with collaborative work in these areas, as well as the development of community based models.